Gold prices edged lower and settled below the $1310 mark as a stronger greenback pushed the yellow metal to close in the red. The US Dollar registered across the board strength during the first day of the week as investors rushed to the greenback in search of risk safety while negative data from the rest of the major economies and doubts surrounding Sino-US trade deal loom. The rising USD added downside pressure on Gold and other commodities. As a result, gold prices are struggling to justify their safe-haven appeal in recent days despite global economic pessimism. 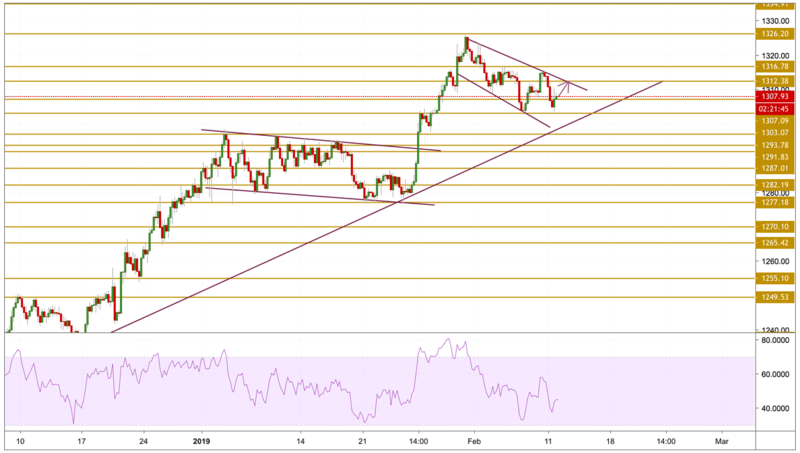 Gold prices decreased again towards the $1303 level as it found support there before bouncing back above the $1307 level. The price is currently hovering just below the $1308 level with a relatively bullish momentum. However, the $1311 which is the most stubborn level to break seems to be the biggest challenge for the bulls and that is the level we will be watching.